I was terminated before a 6 week recovery from a surgery. I was terminated before a 6 week recovery period from a surgery. During this I was working but from home so I never got fully recovered. They called me over the phone to say they were rethinking the technology department. During the call my health issues came up. There was a discussion about working for 2 months as a transition period which I did not agree. and many times have stated on emails. Today I received a contract, but from the looks of it. They wrote it. Basically stating that my terminate is in April and I need to perform my original duties and well as whatever they want to give me. Also states that then I'll be "may be" eligible for a severance package with no indication on what that is. I really need legal advice because as far as I know I was terminated. the 2 months is to help them out. It should not be that I'm terminated after I help them. Can you help? (1) Does your employer have more than 50 employees? (3) The contract specifically states that you will be let go in April? Have you been given any indication as to what happens if you do not sign the contract? And you do have sick leave granted by the company that you are currently taking? Ok, thank you for the extra information. Basically, if you did not have an employment contract previously, then you were employed at-will, and the employer does not need to give a good reason for terminating an employee (or they can give a vague reason). The question then becomes whether or not unlawful discrimination is occurring. The fact that you may be let go in part due to your illness potentially raises issues under the Americans with Disabilities Act, depending on the nature of your illness. What is the nature of your medical issue? I really wasn't look to sue. But what got me to look into advise is that the way this letter is stating is that I'm still employed and terminated until April 30. which I do not want to be there. They terminated me last week. Ok, and when they terminated you last week, did they send you a letter? Was it by phone? Ok, but over the phone it was clear that they were terminating you on the spot? Yes. Her comment was " we are looking at a different direction for the technology department and we must part ways"
this was the day of our conversation. i sent email...Per our conversion this afternoon about my termination at Society for Vascular Surgery and from the understanding that the company would like to go into a different direction with the Technology Department. I was wondering if you can please provide me a letter of recommendation by Monday if possible. I will be in the process of working with my agents as well as interviewing with other companies and would like to use this letter as a reference as I have done in the past with my other positions. I wish SVS continued success, and I want to thank you for allowing me to be a part of this organization. FYI....I do have all the emails printed out. I understand, and can appreciate your worry. It does look as if they are trying to keep you employed there until April, but if you were terminated by phone and have proof that you were (your email and their response should help) then you were terminated. Now, the employer is free to condition a severance on your continuing to work through a "transition" period, that is legal, an employer is not required to give a severance at all, and may condition a severance on the employee working a little while longer before the termination date. In addition, if you choose not to continue working, and consider yourself to have been terminated, receiving unemployment compensation through the state may be complicated or delayed. Essentially, terminated or not, this letter appears to be an offer for continued employment through April, and having access to work disqualifies an individual from receiving unemployment compensation during that period. I really do not want to work for them and really don't want a severance. I just want to make sure I can collect if I need to and they are not stating that my employment is terminated on April 30 and not last week. Right, and what I am saying is that while you may have enough evidence to show that you were terminated last week (your email and their response certainly indicates that you were), their letter could be interpreted as a new offer for short term employment, which could complicate or at the very least delay your ability to collect unemployment. so if I decline then my chances to collect unemployment is 50/50, correct? Maybe a little higher than 50/50, but not 100 %, because there is technically an offer of employment at least through April and so there will be an argument as to whether or not you are unemployed involuntarily. Based on the information provided, it certainly does sound as if you were terminated last week, and as such should qualify for unemployment, but this short term offer of employment may complicate matters. As such, if you decide to consider yourself terminated and not continue working, you should make this clear to the employer in writing (preferably with the assistance of an attorney), and then seek the assistance of an unemployment law attorney to file for unemployment. Working for this company for a few more months probably has the lowest risk, because then at the end of that time there is no question that you are being let go and that you should qualify for unemployment. Refusing an offer of work may at the very least delay the unemployment, and so if you do choose to consider yourself as terminated, seeking the assistance of an unemployment attorney to assist from the beginning of the process is arguably the best course of action. ok. this makes sense with me. I was going to sent them this email. will this be ok to send. After reviewing this contract, it does not reflect what I spoke about with Rebecca on February 20, 2014. 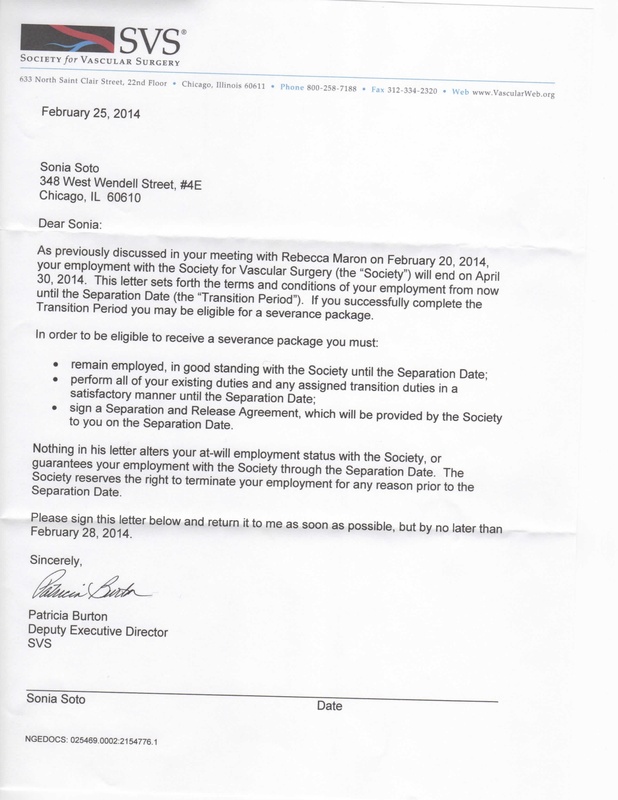 My termination was on February 20, 2014 over the phone when SVS decided to "Part ways" with me. We spoke about a contract of agreement to stay for 2 months for a transition period to help SVS. Date was not spoken as it was undetermined. This was going to be on the contract. The statement "The Society reserves the right to terminate your employment...". I am already terminated. This statements needs to be rewritten to state the termination during the transition period. I am sorry but I cannot sign this by February 28, 2014. I will need more time as I am going to pass this on to my lawyer for review and his comments. That looks reasonable, and articulates your understanding of your conversation. It may also be wise to send a hard copy letter in addition to the email, sent certified mail so that you have proof of receipt. Ultimately, as I said above, should you choose to treat this as being terminated last week, and seek unemployment immediately, make sure to consult in person with an unemployment law attorney before going forward. You are most welcome, and let me know if you need any additional information or need clarification of anything I have said above (never be afraid to ask for clarification!) Otherwise, please remember to RATE my answer so that I can receive credit for my work. is there a way I can get a copy of this chat to refer back too? Let me know if you need any additional information. Otherwise, please remember to RATE my answer so that I can receive credit for my work. Ok, thank you for all your help! Yes I will. Hello AJ. Thanks for helping me last time. It really helped!! I did not sign the contract and explained the reason why I felt uncomfortable signing. They replied with "I am in receipt of your response to the transition agreement letter which you received on Wednesday, February 26. Based on your response to the letter, it is our understanding that your last day of employment with the SVS is Thursday, March 13. You will be paid your regular compensation through March 13 and paid for an additional 5 days of accrued, unused paid time off in your final paycheck. Attached is a Separation and General Release Agreement letter which sets forth the terms for the separation package." Can you review this letter? It's legal and I don't want to sign something that will hurt me in the long run. Again not planning on suing but don't want this to say that I quit since I didn't. Or something else that I'm not understanding. Thank you! Hello again, and you are most welcome. I am happy to look at a letter, and provide information on what, if any, laws might be implicated. However, it is important to remember that this is an informational site only and not a replacement for legal advice for an attorney licensed in your state reviewing your case in confidence. So, I am happy to review anything you want to post, just keep that in mind. I am an ophthalmologist working for a municipal hospital.